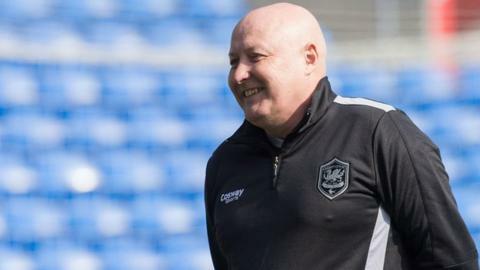 Cardiff City manager Russell Slade has urged the club and its supporters to "pull in the same direction". Cardiff City Supporters Trust called on the club to reveal its blueprint for the future amid fears over player sales and falling attendances. In response, Bluebirds chairman Mehmet Dalman said the club will "enhance engagement" with fans this summer and next season. "You do want everybody trying to pull in the same direction," said Slade. "That's important for any success. My priority is the football, the players and dealing with that. Any off-the-field thing has to be dealt with by the relevant parties." Cardiff are 13th in the Championship table following Tuesday's 3-1 defeat at Ipswich. A disappointing season has seen attendances fall sharply, prompting worries from the Supporters Trust. The Trust has also expressed its concern about leading players such as Kenwyne Jones being loaned out recently. Slade admitted in April that some of the highest earners at the club may be among those to leave at the end of the season. But speaking after his side's defeat against Ipswich, Slade insists he is still determined to build a side which can compete for promotion. "We are trying to build here," he said. "There are two things: the sustainable level we are trying to achieve and, at the same time, we are trying to build to be competitive enough to be in the top six. "That's our aim. Nothing has changed."